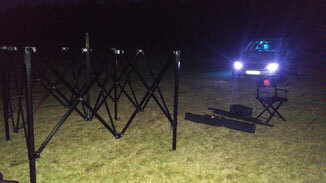 It's been a while since we've set up team camp and Daza didn't really think it through as he rolled up Thetford at 7am, in the dark....lol. Thanks to KLMTB we were allocated a trackside spot in the arena and it wasn't long before our base for the day was in place. The weather was set to be dry and a relatively warm 5-6 degrees. 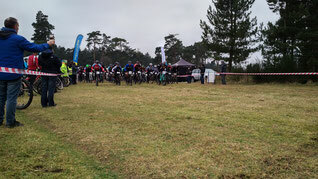 The ground underfoot was also surprisingly dry and solid, all was set for some Fast Thetford racing. We were all racing 1.5 hour long format enduro, the team line up for the day was Matt Ellis (Senior), Glenn Stanford & Darren Evans (Veteran) with Jodie Cole and Nicole Beck (Senior). Kirsty as team helper in the feedzone for the day. We were off, things didn't go well for Daza who had his worst start in years, thanks to something caught in his cleat. After pushing hard he found himself still only mid pack and waiting to enter the first single-track section. Everyone was quite literally long gone so he settled into a rhythm and one by one plucked riders off in the open until catching Glenn. With good team work they gapped clear of a 5 rider group and rode together until reaching back to Gary Curtis (Push Sport). The three battled it out with Darren, who was not in the overall series hunt playing a domestic role for Glenn where possible. The final climb came and Glenn made the call, 'go for it Daz' so he did. Gapping both riders on the climb and riding clear, coming into the arena he looked back he noticed Glenn had indeed then managed to break away from Gary, so a little pull over to the side and the team tactics were completed, Glenn 5th, Daza 6th with Gary 7th across the line. Matt Ellis - After a decent improvement in recent run form the day before (due in part to some weight monitoring post Christmas and getting to the tail end of a cold) I had designs on putting some time into the usual suspects and maybe nailing down series especially if the ground was dry...I just hadn’t accounted for another rider being in the same position. I arrived in plenty of time but missing warm up as they gridded early I settled in on the front row with Mark Wingar, Chris Skinner and team mate @Jodie Cole. Paul Groombridge was late so got stuck on the 2nd row. I had my best start this season and hit the single track in 3rd with Paul leading. Perfect until the guy in 2nd spilled on the single track we all got held up as Paul rode clear. After chasing hard with Mark and Chris behind we caught Paul and I settled in for a breather, as I did an unknown rider (to me) attacked ;I didn’t react & by the time I decided he was getting away he was riding too strongly to bridge ....but I thought I’d give it a go. I pushed within physical and technical comfort levels, riding solo I managed to gain time ahead of my usual competitors despite Patrick Biel pulling away ahead. A longer race than usual (1:48m vs 1:30ish) meant my legs were pretty tired on lap 4 (yesterday’s run and the end of the cold maybe) but I cruised in unchallenged. 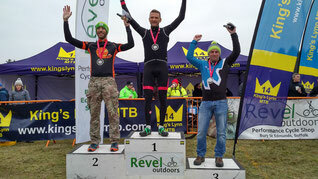 So 2nd place on the day, to a better rider but had a great race especially seeing the rest of the Epic guys smashing it. Should also be enough to secure the series win! Jodie Cole - Having being called for the grid earlier than expected, I didn’t get a great warm up. It needn’t have mattered though as we had a long wait on the start line and then shortly into the race, it got completely congested in the entrance of the first section of single track. This forced many, including myself, to stop and wiggle my way through to get peddling again. Once through it started to spread out and I had room to push on and try and get a good lead on my competitors. Half way around fellow Epic Orange rider Nicole found room to pass, encouraging me to stick with her, but she was just too quick. I’d gone out rather hard, as I always do, and my legs where screaming as we’d reached an inclined section. I had to just go at my pace and find a comfortable rhythm. The rest of the first lap and all of the second where rather uneventful, though I must say that I was loving the course! It was a dream to ride with lots of swooping single track sections. It really had me smiling! At the start of the 3rd lap I ran into Louise Brown of Numplumz, and we stuck together for the first part (whilst having a quick catch-up natter!) before I saw an opportunity to pass a couple of male riders we where stuck behind. Towards the end of my final lap, to my surprise I saw Nicole again - I hadn’t expected to catch her at all. I passed and gave some words of encouragement, trying to get her to stick with me for the last little bit, but the final long drag of a hill was coming and I needed to focus on getting up it. With that I lost Nicole. 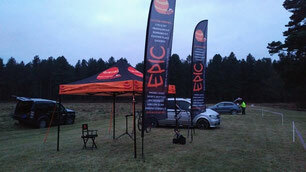 Nicole Beck - I turned up early to pre-ride the course with Darren. This was the 4th time on my MTB and the first time on a dry course so it felt fast. I’ve been struggling with the new position of the bike and by the end of the lap my lower back was causing me pain. After a few stretches, I was feeling ready. I started a few rows back and got caught in the hold up for the single-track, as did most the riders. Being held up behind riders to begin with was a bit frustrating but I do tend to start too fast so I think it was a good thing. As soon as the track opened up onto a nice long flat, I took advantage and caught up to Jodie. I really started to get into it and by the the 2nd lap I was enjoying using the long flat sections as opportunities for over taking and to take on water. As I began the third lap, I felt my energy levels drop and was well and truly hanging on! Just before the final hill, Jodie appeared again with some encouragement but I really had nothing left and knew I had a hill to get up! My final lap was almost 5 minutes slower than my first. It was really great to get 2nd place, especially with Jodie taking the top spot and I’m really looking forward to the next one. 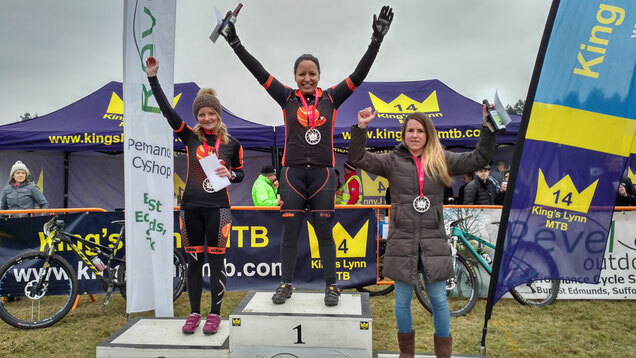 Thanks to Kings Lynn MTB for another awesome event and, as always our co-sponsors KTM Bike Industries and Physio Resolutions.